Make up for photography, how lovely when you perfected it yet how difficult to choose the right product/s to use. With the launch of newest Ultra HD Line from Make Up For Ever, I can't imagine a more perfect way to test these products but a photoshoot with all harsh lighting! The result? I look like I am in my best skin condition (promise, make up lang talaga yan) and I don't look like I'm wearing any make up at all! It was a quick and easy makeover done by Make Up For Ever artists, I get to get close and personal with each product applied/used on me. This is a hydra-plump serum available in ONE shade (Universal) to help the skin looks healthy, plumper and complexion will appear luminous. Housed in a glass bottle with a dropper, a small amount is enough for the whole face before base makeup application. If you have extremely dry skin, you may also drop this on your favorite foundation. This is a perfect product to help prepare tired lips before, during and after lipstick application. This hydra-plumping serum hydrates and smoothes, adding fullness and comfort to lips! I can't wait to give this a roadtest since I have extremely dry and parched lips! Been using the shade 00 Universal for 2 days straight and so far, my liquid matte lipsticks appear better. This foundation gives medium to full coverage and is made for 4K camera. According to Make Up For Ever team, this looks almost invisible on camera and can also double up as a concealer. The feel of this product is lightweight and just like second skin. I got excited to learn this particular stick is perfect for ALL skin types ---- even dry! To make sure your foundation looks invisible and flawless, ask help from your trusted MUFE staffs and artists to pick your right shade! I personally think no matter how seamless and hydrating a foundation can be, if you picked a wrong shade, it will always appear unnatural in person and on camera. I love this foundation so much I actually brought this with me during my most recent Bangkok trip! I even used the same foundation to apply on another person and we both look like we're not wearing much makeup at all! The girl even commented how lightweight it felt and she doesn't feel like she's wearing anything at all even on a harsh, humid weather. Feel free to read my detailed review HERE. It is funny how I haven't veered away from my love of Make Up For Ever Concealer Palette! I've heard so many raves about this particular concealer and it's high time I give this a try! 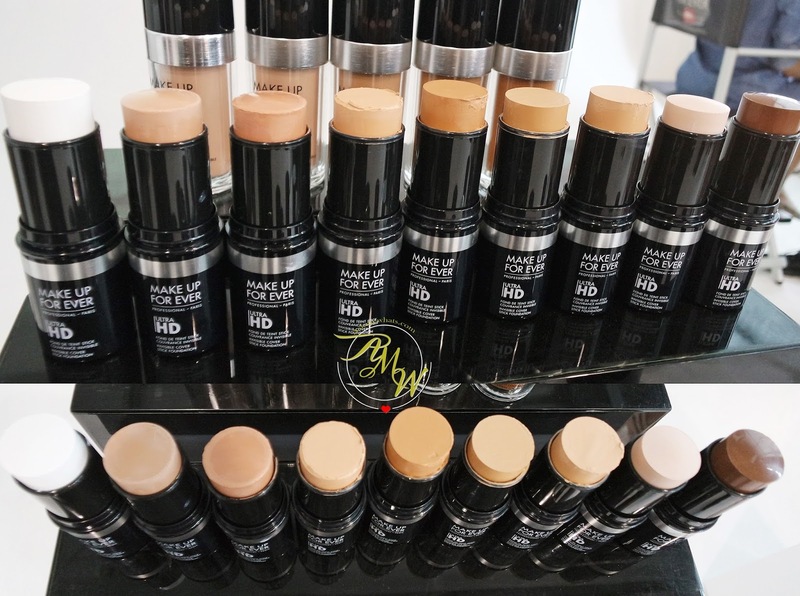 Created for the same 4K cameras, this particular concealer can cover dark circles, unifies the eye contour and hides signs of fatigue leaving a smooth, luminous flawless finish. Medium coverage concealer that can be build and meant for all skin types too. As much as I love my loose powders, I tend to lean on the pressed versions more especially during travel! Now, Make Up For Ever came up with their newest microfinishing pressed powders available in 3 shades! Translucent would work perfect like the loose powder sister while Banana has a slight yellow tone to it making it a perfect setting powder for most Filipinas! Peach on the other hand would be perfect for users with medium to dark complexion! All these finishing powders won't change your natural skin tone. Consisting of mineral silica powder, these are talc-free formula and non-drying. Result: Matte-effect skin minus dryness. I had so much fun learning about each new product, as a professional Make Up Artist, I make sure to update my skin as technology is also improving! Congratulations Make Up For Ever for yet another wonderful line of Ultra HD products. Can't wait to test out more and see which one works! I actually enjoyed how fresh I look for the rest of the day! Have you tried any of Make Up For Ever's Ultra HD Product? Tried their liquid foundation. It's great! :) Nice coverage.